At the end of the sixth round of the Munster Cyclocross League Richie Maes was out front solo taking victory in the men’s race. 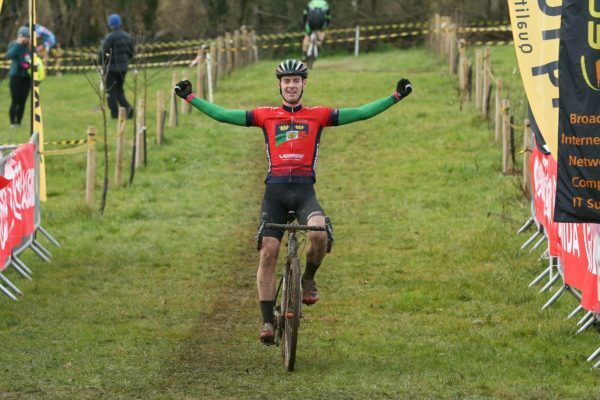 Richie Maes has consolidated his lead in the Munster Cyclocross League with just one race remaining in the 2018 series. The Killarney CC man got clear in the sixth round in Drombane, Co Tipperary, yesterday and pressed home his advantage. In the end he ran out a very clear winner and on current form it will take something special to beat him in the final round. One man who has been riding well, and scored wins, this season is Richard Barry of St Finbarr’s. And in the early stages of yesterday’s contest he pushed Maes closest along with Paidi O’Brien of Gerard-DHL. However, Maes rode away of the others and was never seen again; winning the race after nine laps, and just over an hour’s racing, by 1:35. 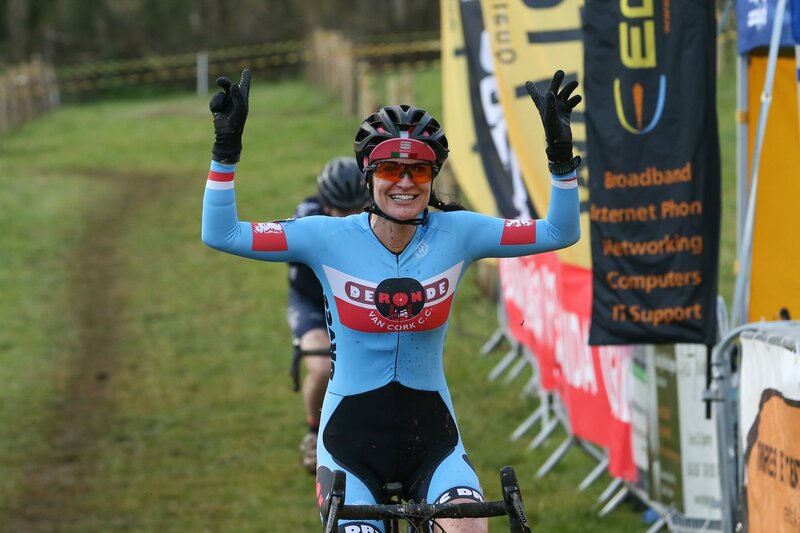 Nessa Rochford takes victory in the women’s race; she was well clear of the opposition on the finish line. Behind him, it was former Continental rider and form national criterium champion O’Brien who pulled clear for the runner-up placing on the day. After his fast start, Barry faded a little and after being distanced by O’Brien he would also be caught and passed by Trevor Woods of Strata 3-VeloRevolution. Then came Paul Caldwell (Epic) and the Strata 3-VeloRevoltion duo of Michael Lucey and Matt Slattery. Killarney CC’s Patrick Clifford was next, with Richard Barry of St Finbarr’s rounding out the top eight. The women’s race witnessed more drama than some would have liked. And series leader Lisa Stapelbroek (Kenmare CC) was a non-starter. In her absence, it was the De Ronde Van Cork due of Grace Young and Nessa Rochford who led the way. Young came into the race in great form after three recent wins, and it was she who pulled ahead in the first half of the race. However, a mechanical with three laps to go cost her dearly. She had to run back to the pits and that saw Rochford go into the lead. That’s the way it stayed to the finish; Rochford never faltering and finishing the job to win by almost three minutes. Young finished in 2nd place despite her problems. And Fiona Gyo of TC Racing rounded out the podium in 3rd place. The result sees Young take the series lead into the final race, with Maes leading the men’s overall standings.